Grown in the misty mountain of Lushan, this AAA grade exudes a high and lasting fragrance that is outstanding even among Famous Teas. "Julian, I saw someone selling Longjing tea in Amazon - how is that different from the Longjing tea you are selling?" "My friend, a Famous Tea is not just a special tea, it is all about where the tea is grown." "It is the location the makes a tea great, not so much the tea plant itself." "There can be many teas with the same name, but the highest quality is still found in the Authentic Source, where the tea was first famous hundreds, if not thousands, of years ago." It is because tea plants thrive only in pristine high mountains. There are only a few handfuls of such places in China, or the world. 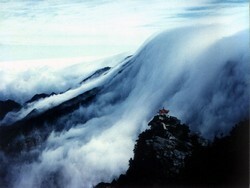 Lushan - which means the Lu Mountain - is one of them, and Yunwu means Cloud and Mist. It symbolizes what rare teas are about: Pristine high mountains shrouded in clouds and mists! She has a long history. Already famous in the Han Dynasty (200 B.C. ), she became a tribute tea during Song Dynasty (1000 A.D.). Sometimes regarded as one of China's Ten Famous Teas, she won the gold medal in the Beijing International Tea Exposition in 2006. 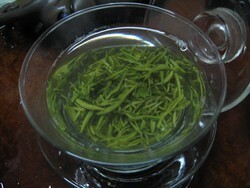 Lushan Yunwu tea. Strong taste. Daring fragrance. Drinking for a long time will beget good health and longevity. This is what I like most about her, that high and daring orchid fragrance that is so mesmerisingly strong and lasting! Famous Teas are very picky about where they live. It cannot be too hot, and it cannot be too cold. 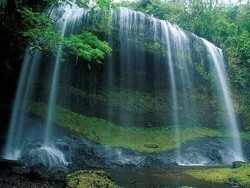 They love water, and like places with lots of rainfall and mists. Also, the soil needs to be thick, loose and acidic. They need enough light, but not too much, otherwise the leaves will grow old, hard and fibrous. In other words, they love to live in the misty high mountains of Southern China! Here, the climate is temparate. It is cool during a hot summer day. While temperature is low at night, tea plants respire less, this helps keep them tender and sweet. The clouds and mists provide rainfall and humidity. They also provide natural shading, which protect the leaves from strong sunlight, and keep them youthful, tender and sweet. 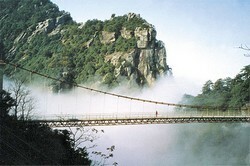 This brings us to Lushan - the Mountain that is most famous for its hanging clouds of various shapes and forms! 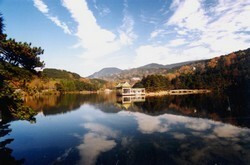 With its many lakes, rivers, waterfalls, rocks, peaks, caves and hills, Lushan is breathtakingly beautiful. With its cool climate, it is widely regarded as one of the top four summer hideouts in China. It is a spiritual paradise. For thousands of years, monks, taoist practioners, Christians and Muslims lived and practiced their faiths in the Mountain. A Unesco National Park, it houses the first botanic garden of China, which was established by the monks in the 1930s. With its subtropical climate, it hosts a large variety of plants and animals. In particular, it has the largest population of white cranes in China. There are many types of Lushan Yunwu tea. 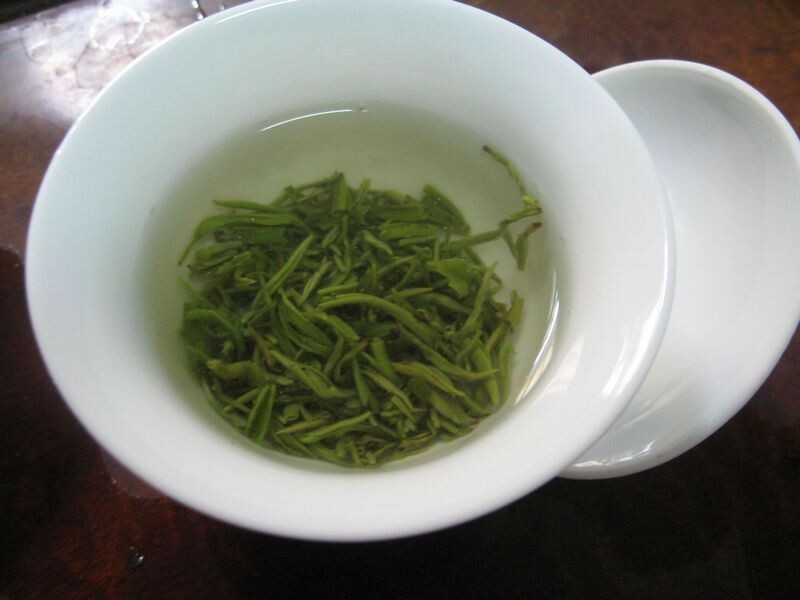 Some are shaped flat and broad, like Longjing. We are selling a traditional variety, which is delicate and curly. We are truly impressed with the high and lasting fragrance of this AAA grade. It is potent, you need only a tiny amount each time. It can work out quite economical! A Song dynasty poet described her fragrance as daring, and I heartily agree. There is something intense about her. You won't believe it, but we find it is best to enjoy this tea with a tiny amount each time (say 1 gram). Use low temperature water. Dip your finger into the water and makes sure it doesn't feel hot! Drop the tea buds into the luke-warm water. Watch the tea buds fizzle and uncurl, restored to a beautiful green. The wet leaves consist mostly of a single tea buds. The tea liquor is a light yellow with a beautiful glow. My journey to your website began when I was looking for a better option to coffee and even black or oolong teas (which didn't make me feel very good). I knew green tea was most desirable but I couldn't find one I liked. Healthy eating has been my choice for the last forty years, but a green tea that I truly savored eluded me. After a more diligent search of the web, I saw your amazing-green-tea site. The name alone caught my attention because "amazing" didn't fit "green tea"! Since then I have tried many of your teas and find them all to be above what I had known. The one that stands out the most is Lushan Yunwu. I have come to prefer green tea if it's Lushan Yunwu! As you have taught us, notice everything about it--the smell, the taste, the lingering taste, the after feel, the re-steep. This all comes together perfectly in Lushan Yunwu. Maybe it has more to do with personal preference, but I was not expecting such satisfaction with a green tea. We have tried many Lu Shan YunWu teas from a variety of sellers over the years. Frequently we have found this tea to be less than it should be -- but Amazing-Green-Tea has not failed to provide a very, very high quality version of this tea. If you do not see bright green leaves and a balanced, smooth, sweet taste, it is not a good example of this tea. It should have a rich, meaty aroma - reminiscent of artichoke with a hint of earthiness, but sweet and smooth. The tea leaves are tiny, so we use a lower temperature for a shorter steep - like maybe 168 degrees Fahrenheit. We use about 8.5grams per pint/16 oz of water for about 1 minute. Don't settle for an inferior version - we have found only a few good sellers and Amazing-Green-Tea is one of them. The Lushan Yunwu 2013 has a very distinctive smooth flavor compared to other green teas that I have tasted. It is not bitter and will provide three infusions per teaspoon. The aroma that is given off while being tasted is also a nice bonus. Since I am a tea novice my descriptions may not be professional, however, I can tell a good tea from a bad one when they are side by side. So far, in the US, I have not been able to find any green teas like this one. Hope you enjoy it too! Wonderful fragrance and a sweet, smooth taste. I cannot believe that I am only the 3rd person to write a review as this is such a wonderful tea. It's not to strong or to weak but right in the middle in terms of it's body. It gives me a great after-feel. This tea is not all that finicky as long as you brew it at ~ 150-160F as Julian suggests. I usually get two steeps and occasionally a third. However, a little goes a long way so this tea is a bargain. The Lushan AAA tea is amazing, it has incredible aroma in the bag and brewed. You are right that I don't need a lot of this tea for a great flavored brew - I use half as much as I do for most other teas. This might be my favorite tea now that I have tried it. A popular tea chain in USA sells a cloud tea that is okay buy not nearly as good. This Cloud and Mist tea is very delicate, it needs to be brewed the same way as the Biluochun tea using hot water of 160 Fahrenheit (70 degree Celsius). She comes best with when brewing a tiny amount at at time (say 1 gram), in low temparature with long infusions.